Ping's Cafe Orient by PCO - CHOMP! SLURRP! BURP! Tucked inside a street in Lodhi Colony is Ping’s Cafe Orient by PCO which immediately hauls you from the rarely peaceful Delhi street to a feet tapping, bright street in ChinaTown. The interiors are done very tastefully in the cosy little cafe – red walls papered with advertisement and flyers with lamp posts and arched mirrors. The antiquities that are lined in the cafe are most exquisite – tea pots, cutlery and bulbs. You can quite literally ping your server by pressing the switch next to your table. 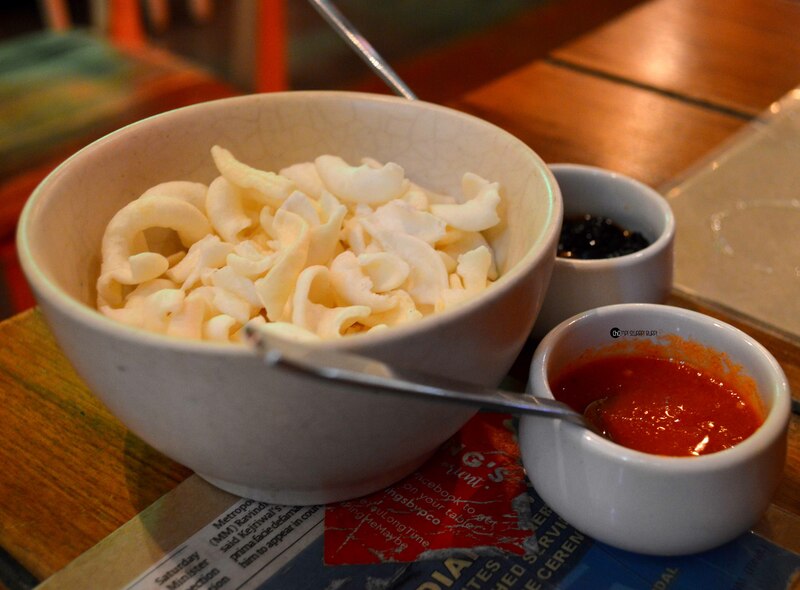 Start your meal with a bowl on pistachio chips, chilly samba sauce and black bean sauce. 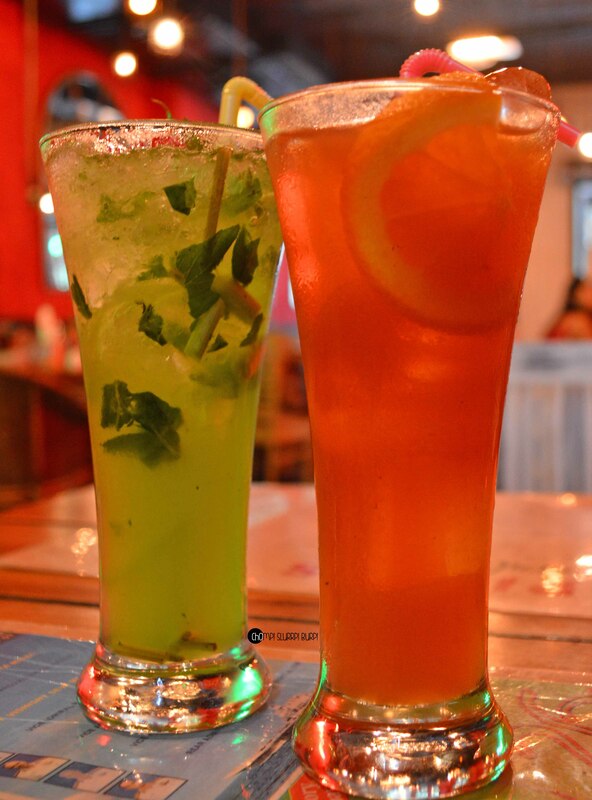 For drinks, we ordered a Thai lemongrass cooled and a spiced iced tea. The lemongrass cooler was so refreshing and satiating, the underlying taste of lemongrass wasn’t overdone which is the case in many outlets which made this drink an instant hit. 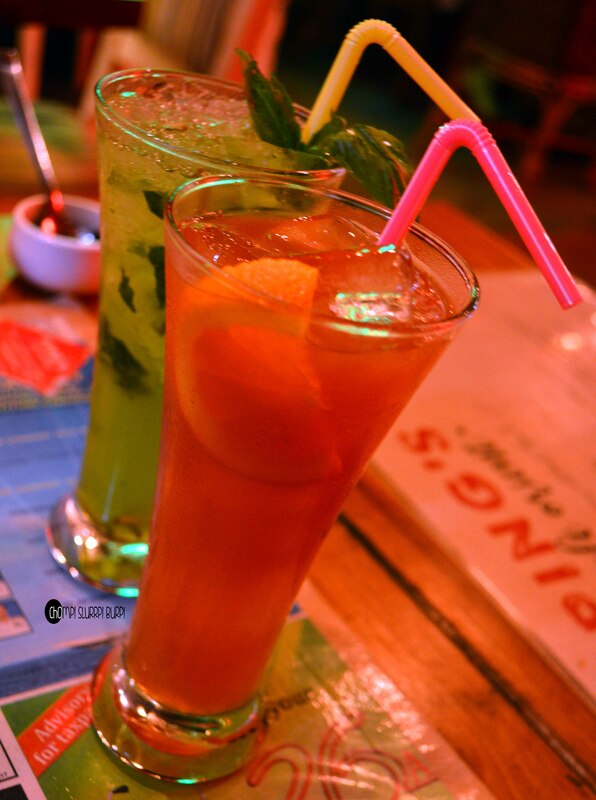 The sui generis flavors of the spiced iced tea again packed a punch. We gorged on their shareable dimsums and baos both. 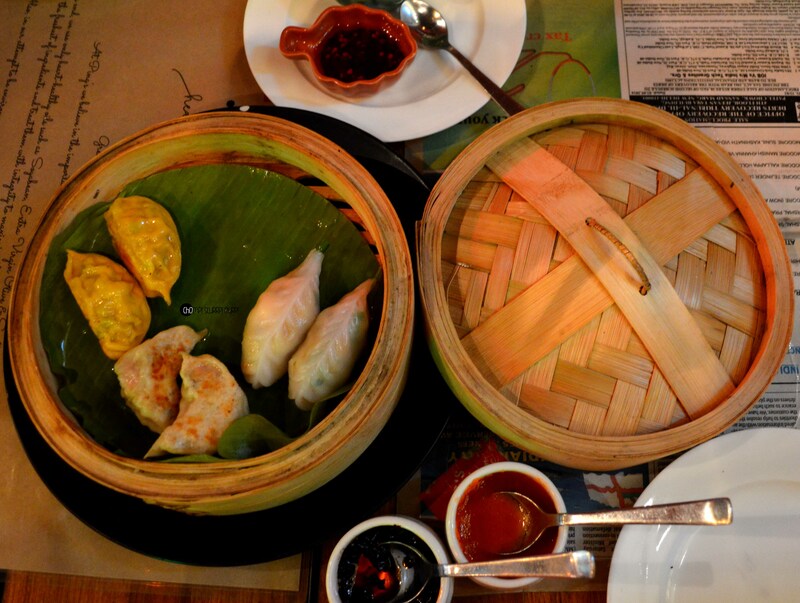 The dimsum basket came with tiger prawn dimsums, pork gyoza and spicy chicken dumpling. 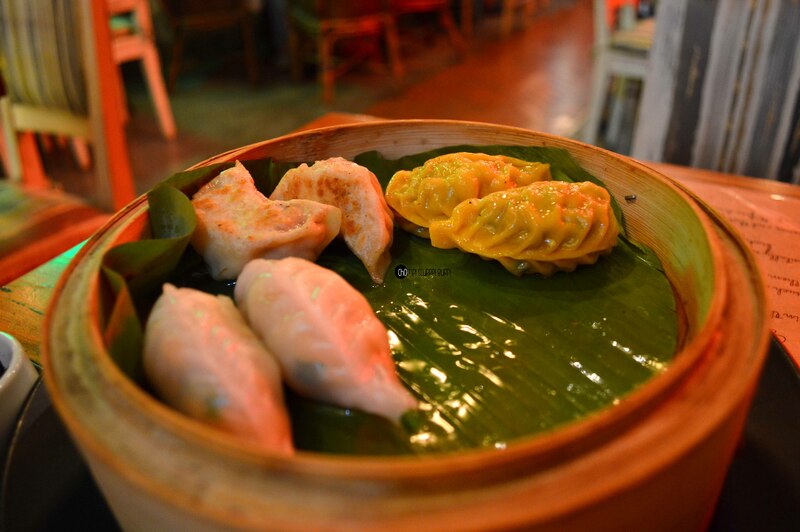 The dimsums were steamed to perfection and stuffed generously with fresh, succulent meat. The spicy chicken dumpling was soft and flavorful but the chicken could have had more profound flavors. The pork gyoza was gently pan fried and stuffed with stir fried minced pork. The tiger prawn dumpling was what stood out of the three – a translucent skinned dumpling with minced tiger prawn – the freshness of the prawn was brought out very well with the skin and seasoning. We also tried the Pork char sui and Chicken teriyaki bao – both the baos were extremely fresh lined with crunchies and meat. Again the chicken could have been more tender but the pork bao was absolutely delish. 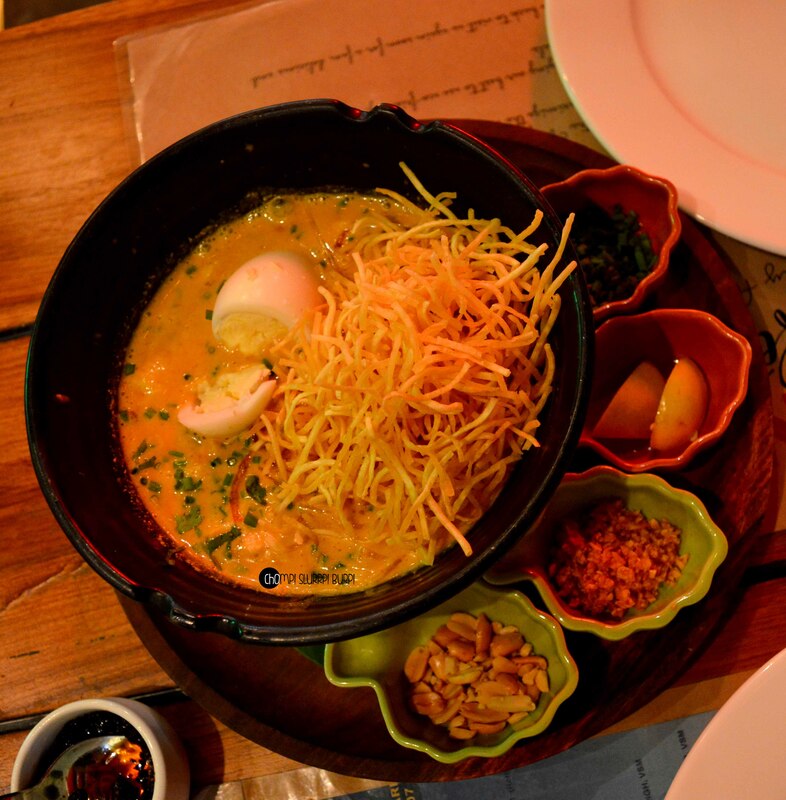 For mains we got our hands on chicken Khao Suey, chicken fried rice and diced chicken in black bean coriander sauce. 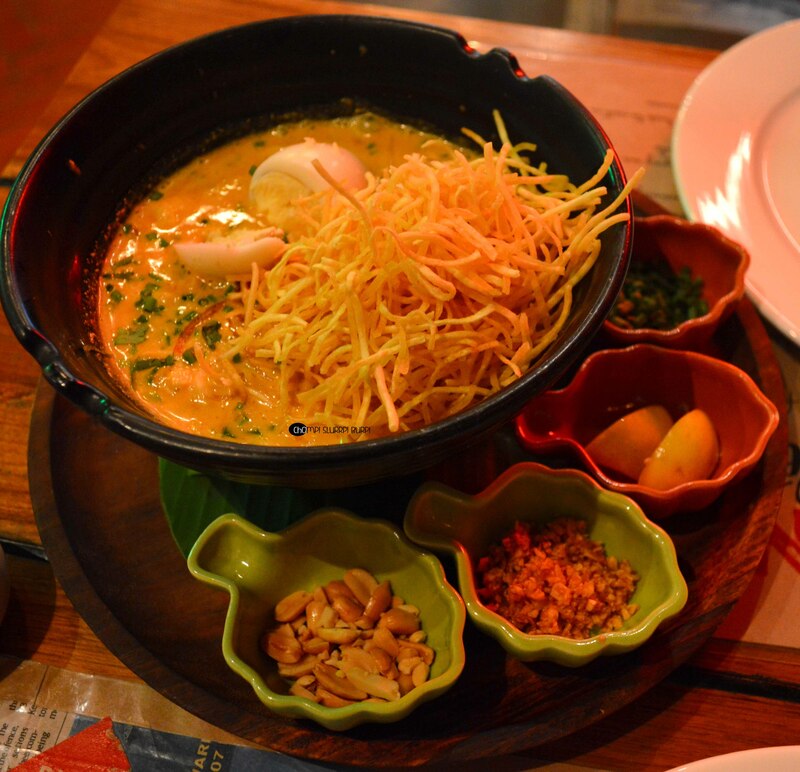 You can prepare your khao suey seasoned with peanuts, burnt garlic, lemon and spring onion sprigs. We seasoned ours with some peanuts, loads of burnt garlic and a dash of lemon juice. The lemongrass had a flawless perfection and the consistency made it all the more palatable. The chicken fried rice were crunchy and mixed with egg and chicken – enhance the zests with chicken in black bean sauce. The chicken pieces were huge and succulent, tossed with bell pepper and crunchy bell pepper in black bean sauce. Why Ping at Ping’s Cafe Orient? Their delectable sharables – especially the baos and the khao suey.